We kick off a miniseries of texts from medieval travelers by continuing with Gerald of Wales as he sets out to tour Wales with Archbishop Baldwin, collecting stories from the region and getting involved in a few escapades of his own. Gerald of Wales. The Itinerary and Description of Wales. Translated by Richard Colt Hoare, introduction by W. Llewelyn Williams, Everyman’s Library, J.M. Dent and Co., 1908. Archive.org, https://archive.org/details/itinerarythroug00girauoft. Gerald of Wales. The Journey Through Wales and The Description of Ireland. Translated by Lewis Thorpe, Penguin, 2004. Bartlett, Robert. Gerald of Wales: 1146-1223. Clarendon Press, 1982. Coulter, Cornelia C., and F.P. Magoun, Jr. “Giraldus Cambrensis on Indo-Germanic Philology.” Speculum, vol. 1, no. 1, Jan. 1926, pp. 104-109. JSTOR, doi:10.2307/2847347. Sargent, Amelia Lynn Borrego. Visions and Revisions: Gerald of Wales, Authorship, and the Construction of Political, Religious, and Legal Geographies in Twelfth and Thirteenth Century Britain. Disseration, University of California, Berkeley, 2011. Sims-Williams, Patrick. Irish Influence on Medieval Welsh Literature. Oxford UP, 2011. 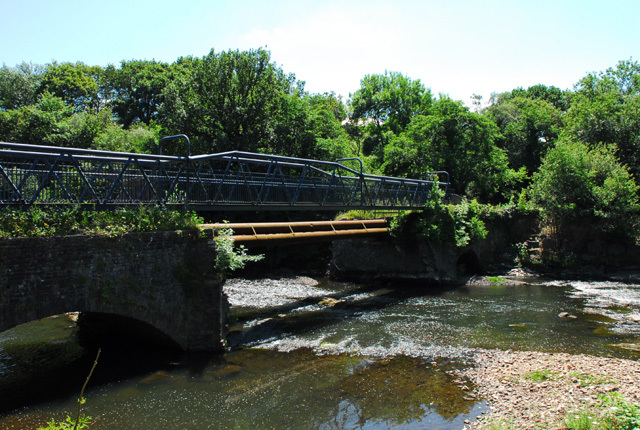 Image: Footbridge over the River Neath by Cedwyn Davies (used under CC BY-SA 2.0 license). “This is a favorite reference of Gerald’s. Here he wrongly ascribes it to Solomon, i.e., Proverbs. In The Topography of Ireland, III.48, he gives the correct reference to Saint Jerome, Epistola ad Rusticum monachum (Saint Jerome, Letters, ed. Jerome Labourt, Paris, 1961, Vol. VII, Letter CXXV, p. 125): ‘De amaro semine literarum dulces fructus capio.’ It seems to be a rather dim memory” (Thorpe, p. 133, n. 201).